Americans have stepped beyond their traditional list of preferred cities and towns in the UK, and have given Chester their vote ahead of them all as one of Europe’s most beautiful cities. The only places ahead of Chester in the poll by USA Today were all in Europe – Riga in Latvia, Bergen in Norway, Innsbruck in Austria and Dubrovnik in Croatia. 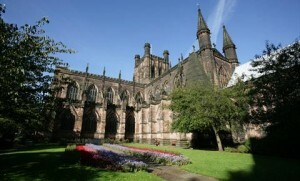 Chester will relish its accolade even more, as it is the only place in the UK to appear in the newspaper’s top 10. Sitting below it in the list are Prague, Budapest, Santorini, Venice and Bruges. That last observation may stretch the truth, but it was very hard for even historic cities such as Chester to resist the reconstructionist urges of post-war philistine planners. Too many abominations were slipped into the streetscape. I don’t recommend, for example, that you give too much detailed scrutiny to the rooftops of York from the one high hotel on the river in the centre of the city. Fortunately most visitors see these ancient cities from street level, or at most from, in the case of York and Chester, the miraculously surviving Roman walls. Chester has one of the longest Roman walls in Britain. You can make a near complete high level circuit, looking down on the old city like a supercilious centurion of the 20th Legion on patrol. There’s a fine view of the largest open Roman amphitheatre in Britain, and the Roman Garden, with paths and geometric beds of medicinal plants of the time (thyme, periwinkle, salvia, and alchemilla), shaped like a serpent coiled around a staff of the Roman god of health. At one point the wall overlooks the river Dee, with the race track and the Welsh mountains beyond. Chester’s Roman walls can be measured against other cities’ fortifications. As a surviving detail of mediaeval commerce, The Rows don’t have an equivalent anywhere in Britain, as far as I know. The origins of the two-tier shopping galleries running the length of streets in the city’s historic heart, is uncertain. Whatever the truth, this unique retail feature has survived largely intact. Eastgate Clock, the North’s version of Big Ben, and said to be Britain’s most photographed timepiece after the London landmark, is a good place to begin a tour. Regularly positioned staircases lead you to the upper levels, where sloping wooden walkways pass interesting independent shops and boutiques. The Roman walls and the Medieval Rows are places for patrol and parade. To recline and relax you ought to head to the cathedral. I can’t think of a more tranquil inner-city ecclesiastical spot than the garden locked in the heart of the Cathedral and its cloisters. Leave it to last, after a tour of the Norman arches and gothic columns and many interesting features of this 700-year-old building. One painting extols Henry VIII, who – unusually for him – spared the adjoining monastery buildings. It’s worth searching for the wood carvings dating from 1380. Look for the elephant with horse’s hooves – the work of a carver who clearly never saw Africa – the Virgin and Child painted on a web, and the Chester Imp, a carved image of the Devil in chains. The C13th Refectory, where the monks used to dine, has a wonderful stained glass Creation Window, made in 2001. Next stop Boodles, to closely examine £10,000 diamond rings (lowest prices around £200). Nobody says you have to buy. Then on to “Indulgent High Tea” at the city centre Grosvenor Hotel and Spa – champagne and strawberries, and enough sandwiches, scones and pastries to provision a small army. The big end of year attraction is the Christmas Market, located within the heart of the city by the Town Hall and the cathedral. It follows the tradition of the continental markets, starting at the end of November and continuing until Christmas Eve. Festive food includes roast chestnuts, grills and crepes, as well as hot soup and mulled wine. I made one trip out of the city centre, to progressive Chester Zoo. If we must have zoos, let them all be spacious out-of-town centres for rare animal breeding and conservation like this. The Butterfly House was a warm and welcoming, if steamy, refuge on a cold day. Brilliant tropical specimens in blues and purples fluttered languidly past my nose. The Twilight Zone is the largest free-flight bat zone in Europe. The zoo’s latest initiative is to create a series of South East Asian islands, in one of the biggest zoo development programmes in Europe. I stayed at Oddfellows Hall, the sort of rare hotel that hauls you in from the street through its sheer sense of fun. The renovated C17th Georgian manor house opened in 2008, determined to be different from the city’s other distinguished period hotels. They start with a visual joke – an upside down table in one of the dining rooms. Beyond the Champagne Bar is a restaurant under a glass roof in the walled garden, with heated Bedouin tents beyond for year-round drinks. The city is served by a distinctive train on the line from London, one of Virgin’s diesel-powered sets. Those busy trains shuttle directly up from London Euston, putting this important Roman city within easy weekend-destination (or a long day trip) travelling distance. I would imagine it’s an easy place for foreign visitors arriving at St Pancras (only a 10 minute walk to Euston station) to head for, too. I included Chester in my e-book, Awaydays in Britain – Spoilt for Choice. There is a link to that and my other e-books here.